Art therapy, as defined by the American Art Therapy Association, is the therapeutic use of making art, within a professional relationship, by people who have experienced illness, trauma or challenges that have caused varying degrees of dysfunction within their lives. Art therapy is helpful for people who seek personal development through creating art and reflecting on their artwork and the process of making art. Through art therapy an increased awareness of self is developed. The self that emerges through the creation of art in art therapy is enhanced and stablized, enabling one to cope with challenges, stresses and trauma. The learning process is enriched through creating art and enjoyment of art making increases self awareness, cognitive abilities and defines the life-affirming pleasures of making art. The American Art Therapy Association promotes established standards for art therapy education, ethics and practice. Volunteer committees composed of members and other experts in the field actively work on governmental affairs at the national and state level, clinical issues and professional development. The Association’s dedication to continuing education and research is demonstrated through its annual national conference, publications, its distance learning capacity which is in development and national awards recognizing excellence in the field of art therapy. 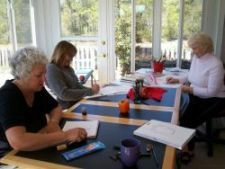 Art therapists, as defined by the American Art Therapy Association, are masters level professionals who hold a degree in art therapy or a related field. Educational requirements include: theories of art therapy, counseling, and psychotherapy; ethics and standards of practice; assessment and evaluation; individual, group, and family techniques; human and creative development; multicultural issues; research methods; and practicum experiences in clinical, community, and/or other settings. Art therapists are skilled in the application of a variety of art modalities (drawing, painting, sculpture, and other media) for assessment and treatment. An art therapist requires a license to practice art therapy. Art therapy licensing differs from state to state. Art therapy addresses a part of the brain that is often functional when other parts are dysfunctional or not functioning well. Many can benefit from art therapy, including hospitalized children, teens, adults and the elderly. In addition, art therapy benefits the mentally ill. In many cases, those with depressions, fear and anxiety caused by trauma or developmental challenges have difficulty expressing their deep feeling. Creating art often allows them to begin to become released from their own dysfunctions. The elderly, and particularly Alzheimer's patients, suffering from varying degrees of memory loss, time and space dysfunction do to aging can respond to drawing, painting and sculpting and begin to take control and regain some of these lost capabilities. Studies have shown that art therapy sessions with the elderly have encouraged memory and brain function--creative movement has reduced the risks of falls and accidents and encourages balance and movement. The Museum of Modern Art in New York has a program called "Meet and MOMA." On Tuesdays, when the Museum is usually closed, group of Alzheimers patients and their caregivers tour the galleries. The stimulation of seeing and discussing artwork enriches their lives and stimulates them mentally. Since the establishment of this program, many patients have exhibited marked improvement in memory, cognitive awareness and self expression. Art therapy helps prisoners address their angers, fears, and resentments. Through creating, they begin to see themselves and realize what motivated them to commit a crime. And art making gives many a chance to develop a skill that can enrich, not only their lives, but the lives of others. Art and the creative process brings balance, self-esteem and enjoyment to anyone who is challenged by mental or physical disabilities. Through the creative process, deep-seated feelings emerge in an gentle, nurturing atmosphere. People are enabled to meet their worst fears, anxieties and challenges by doing artwork that expresses that challenge. When it is identified, view and discussed, often the overwhelming proportion is diminished. In a group, the participants realize that others have fears and problems also, just like them. Eating disorders can be addressed and in some cases, cured by creativity because the underlaying cause of the disorder is often hidden and emerges through the art work. Art therapy, active in a professional setting, creates a sense of self, that which is often lost in the elderly, Alzheimers patients or those with mental illness. Sensory stimulation through art making fills in where there is a deficit of sense of self and sensory stimulation. This is proven through the use of any and all uses of art materials and skills, including painting, drawing, water color, collage or sculpture. For example, collage creates a sense of putting things back together and connectedness. Creating a collage deals with the juxtaposition of identifiable images that resonate in the individuals' experience and can bridge the communication gap between the anxiety or fear a person feels and the outside world. Making art externalizes and through discussion with an art therapist who can interpret what the art work says relative to the patient's behavior and challenges, the patient can begin to identify that which impedes their thiking and balanced growth. As evidenced by the Meet At MOMA Program, Alzheimer's affects that part of the brain that makes memories. The parietal lobe is stimulated by art. When a patient looks at a painting, the painting encourages a dialogue with the viewer. Questions and interpretations of the visual response develop. Those that cannot remember their name or the names of their loved ones, can often, talk about what they see in a painting and be clear about their own interpretations of the painting. Often memories are stimulated as well, and things forgotten come into the dialogue. When those in art therapy are given paints, pencils, clay, or collage materials, a here and now, active stimulation begins. Through work with the hands, imagination is stimulated and, it has recently been discovered that the magination will be there when the rest of the brain is dysfunctional through a progressive disease such as Alzheimers. There is an important need to get thoughts and feelings out in some way, especially in teens, adults and the elderly. It has been evidenced that very young children who have not yet learned how to express themselves verbally, will grab a crayon and begin drawing naturally. Older persons are challenged because they are at a loss to express themselves, but can find balance and enrichment in painting or drawing. Art therapy demonstrates that creativity is a deep core need in all of us and that making a painting will help one remember, recall the past that had been forgotten. There is another value to art therapy, as well. Institutionalized people, those in prisons, nursing homes and hospitals often feel they are just a number or a file. Art therapy gives them back their individuality. These people are given back a sense of control over their lives that they had to give up for going into an institutionalized environment. And in a hospital setting, expecially for people with a cancer diagnosis--it is often very difficult to talk about it. Art gives them an opportunity to express the way they feel, come into control and alignment with their feelings and give them, through the art therapist, a perspective on their life. In Saudi Arabia, a psychological and religious counseling program for militants has been developed incorporating art therapy for imprisoned jihadists. This successful rehabilitation program came into operation today as the result of the Saudi's commtitment to lessening the production of home grown Jihadists. The International Medical Corp provides clinical support for people on the front lines of disaster and uses art therapy to rehabilitate victims of war, famine, political upheaval, and natural disasters. The National Geographic Society has supplied cameras to people in Uganda to take pictures of their lives and work through the pain and loss they have experienced through war. Ultimately, what we are discovering is that no one is safe from the anxieties, challenges and fearful factors of every day life. And, as we begin to realize that physical health and mental health often are integrated and dependent on each other, the role of the art therapist becomes more and more important in addressing our well being the development and maintenance of our total well being. I have found that there is a therapy in art instruction. Every time I teach an art class I am aware of it. Before I started teaching (which was many years ago!) I remember assisting an instructor in his class and feeling that what made the attendance drop after a few weeks was the way the instructor was treating his students. I decided that I could definitely improve on his abandonment of his student and his cursory way of instructing them. I made up my mind to provide, not only information-rich instruction, but a supportive, encouraging atmosphere within which students could be nourished and grow creatively.